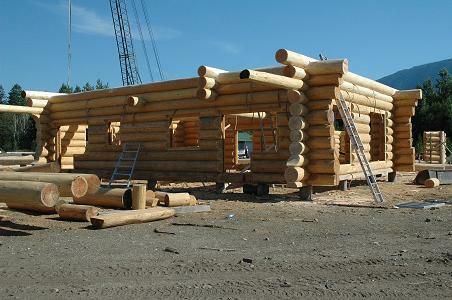 At the beginning we have been very optimistic to be able to build a log-home ourselves. But as it turns out, there are hundred of little issues that have to be thought of. – How do we build the base concrete slab? – What materials can we use for the roofing? – How does shrinking affect the construction of walls? – Can the log directly sit on the concrete slab? To solve all these issues and get answers to these questions we found many friends that are helping us to get along with these issues. So we have found a lot of friends, very nice Swiss- and Canadian-people that are helping us to getting these things properly sorted out. There is Mike Odermatt, our log-home builder. He basically did all the log-construction work and prepared the log-shell. Unfortunately Mike has stopped building log homes. This was a very sad news for us and we hope, he feels happy with his new job. Maybe he will start again to build beautiful log homes in a few years (we hope so). And there is Anke Krause, the lady that did all the wonderful drawings and plans for us. She translated our words and ideas into drawings & plans. She got all our changes done within minutes and helped us with her experience on issues like “what type of endings at the logs?” or “windows inserted in doors brings light and sunshine into dark rooms”. Without her help thing would have been much more complicated. Then there is Mark Recksiedler from Westwood Windows and Doors. He helped us to get protection against the cold weather and the rain with his beautiful wooden-windows and solid doors (all red cedar!). vor 15 Jahren haben wir in Deutschland ein Log Home gebaut, leider haben wir jeden Kontakt zu unseren Architekten und Aufbauern aus Canada verloren. Wir wissen nur das ein Mike dabei war und ein Ludwig. Da das Haus von Superior Log Homes aus Canada geliefert wurde (Fam. Odermatt) und ich beim Googeln bei Euch auf der Seite auf einen Mike Odermatt gestoßen bin hoffe ich ihr könnt uns helfen.